New York : Liveright Publishing Corporation, 2016. 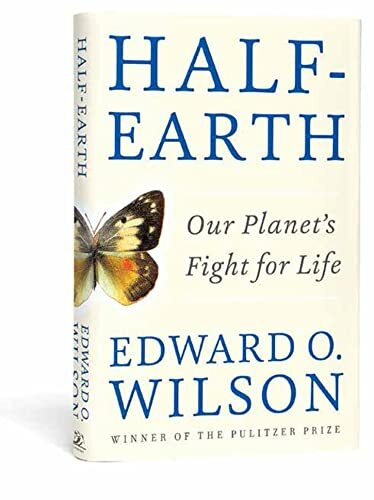 "In order to stave off the mass extinction of species, including our own, we must move swiftly to preserve the biodiversity of our planet, says Edward O. Wilson in his most impassioned book to date. Half-Earth argues that the situation facing us is too large to be solved piecemeal and proposes a solution commensurate with the magnitude of the problem: dedicate fully half the surface of the Earth to nature."--Amazon. Edward O. Wilson is angry, and so is his book. No one is listening and things have gotten unbelievably worse. There’s no evidence to provide any real hope. He describes future paleontologists easily identifying the sedimentary layers of our era by the amount of chemicals and plastics in the soil strata, by the fragments of machines and weapons everywhere, and the lack of varied species identified. This is our legacy. As I have written elsewhere, it took the Earth four billion years to reach the Holocene, an era where climate, ice, water and life achieved a state of pleasant equilibrium, with jet streams and ocean currents arranged in a virtuous circle. In just the last 150 years, Homo sapiens has upset the entire system, killing off the Holocene in favor of the Anthropocene, in which one invasive species rules, and any other species that does not add to its immediate benefit can be eliminated. And if even if it does add to its benefit, if it hasn’t been domesticated, it can still face extinction. We are clear-cutting the biosphere. The book is a relentless, hardhitting – make that pounding – indictment of our custodianship. We are far worse than negligent; we are malevolent. We think it does no harm to remove a species from its environs – and its role. The way it really works is there are no species living on the periphery; every species depends on other species or is critical to the survival of others. Our total disregard of this simple rule causes disaster. Wilson has been a naturalist all his long life, and it pains him to find things in this state. His childlike appreciation comes through, often overtaking his anger with the wonder of various species and how they live and contribute so differently. That we lose them daily before we even know how they fit in is criminal to him. Wilson has introduced me to an ugly new subspecies. I will call it the Anthropocene Apologist. AA appears to be a subset of scientists and ignorant people whose attitude is yes, we’ve already wrecked this planet, so let’s just take what we want now and not worry about it. AAs say we should welcome all the invasive species because they fill gaps left by species we made extinct. That they will figure out what to do about the mess when the time comes. It infuriates Wilson. He keeps bringing it up in different contexts, probably because after a lifetime of watching the degradation, he can’t believe there are actual AA scientists promoting it. His solution is to set aside far more than the 15% now dedicated to wilderness areas and parks. He says we need 50%. This is obviously not going to happen, as populations explode at the same time as land mass disappears (in the rise of the oceans), and less of what’s left is habitable. The book ends very weakly with a plea: Do no further harm to the biosphere. In Half-Earth, American biologist and Pulitzer prize winner E.O. Wilson gives a well-researched, well-documented, eloquent, but above all, impassioned plea on behalf of our planet and all of those who call it home, human and non-human alike. Species are dying out at an alarming rate and it is Wilson’s contention that “only by setting aside half the planet in reserve, or more, can we save the living part of the environment and achieve the stabilization required for our own survival”. Wilson points out that thanks to our behaviour in just the last two centuries, we are now approaching the Anthropocene, a period created by us at the expense of other species. He gives some very interesting counterpoints to those who would argue that this Anthropocene Epoch is now inevitable; that it is really too late to stop completely the march to extinction and we should put all our energy and resources to saving those species who are most useful to us, that in the end the system will right itself. But, as Wilson shows, nature is a complex system in which species depend on each other for survival. To allow the end of even the tiniest mollusk for example can lead and likely will to the end of species that were dependent on it for sustenance starting a chain of extinctions eventually leading to us. Wilson has a more appropriate albeit emotional name for this period, the Eremocene or the Age of Loneliness. Clearly, Wilson believes that it is time that we stopped seeing ourselves as rulers of the planet and became instead better stewards. He shows clearly and concisely how overpopulation and growing lack of arable land and water rather than religion or historical injustice are driving many of the problems we are facing today in eg the Middle East and, if nothing is done and soon, these problems will only get worse. Incredibly depressing but a very worthy must-read. Highlights included the list of natural history ecosystems worth saving and visiting. Weakness: The last chapter, an odd discourse on biotech and artificial intelligence. Human activity is causing extinctions and rapid change to ecosystems. We all knew that already. What may be a revelation to some readers is how little we truly understand about what it is we are doing or what the results might be. We can only estimate the number of species we have driven to extinction because we still don't have anywhere near a complete account of all those that exist today. We can be reasonably certain that this list will be shorter tomorrow, however. Our understanding of how all these species interact with each other and their environment is also incomplete. Local ecosystems and the larger biosphere seem intricately balanced, so sudden changes can have unforeseen and catastrophic consequences. One of the species we drive to extinction may be our own. In this book, Wilson argues that our knowledge must be expanded. But at the rate species are disappearing, we won't be able to accomplish anything approaching a complete understanding before many species and their habitats disappear. He suggest that human development be restricted over 50% of the planet, specifically from those places that still can be returned to a state in which they existed prior to human encroachment.